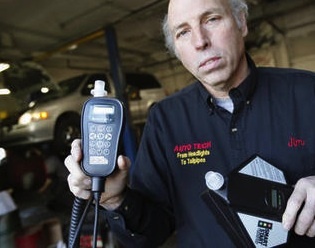 Changes in the way the Michigan Secretary of State’s DAAD, or Driver Assessment and Appeal Division, handles alleged ignition interlock violations have cause a dramatic increase in the number of violation cases I have seen. Chances are that if you’re reading this, you’re either facing a DAAD interlock violation, or, in some way and for somebody, this topic is important to you. This article will address the specific class of violations that occur after someone has won restoration of his or her driving privileges from the DAAD (usually after multiple DUI’s) and is still on a restricted license and required to use the interlock device. Although the law requires a person that wins his or her license back after an appeal hearing to drive with the interlock for a minimum of 1 year, lots of people who get “violated” are either very near or already past that first year at the time something goes wrong. It is important here to emphasize that an interlock violation is very serious business. I say this as someone who frankly detests alarmists and lawyers who use scare tactics. However, in the context of an ignition interlock violation, you not only risk the long-term loss of your privilege to drive, but also being seen by the DAAD as having consumed alcohol and/or tampered with the interlock unit after you were approved for a restricted license. If the violation is ultimately sustained, it’s going to make winning your license back a lot harder next time. Frankly, it doesn’t get any worse than this. This is worth repeating: If you lose here, you are way farther behind than just having to start all over again. You’re going to be seen by the DAAD as someone who won a license back and then either drank again, or tampered with the machine, which, to the state, just means you drank again and tried to hide it. Good luck coming back the next year, or anytime, for that matter, and trying to use your old sobriety date. I wish this process is as easy as saying “bring me a whole bunch of money and I’ll make the violation go away,” but it’s not. Remember, I’m the guy who guarantees that if I take your driver’s license restoration case, I’ll win it. Things are much darker and different here, when a violation has been issued. The only guarantee you have when facing an ignition interlock violation is that there will be a lot of work involved in defending it. Let’s back up for a moment and talk about what first happens when the state receives notice of a violation. Technically speaking, if it’s what’s called a “major violation” (and you would never have been notified if yours was anything less), the SOS (Secretary of State) will “reinstate” the previous action, meaning reinstate your license revocation. The language can be confusing, but the result is plain enough: once the SOS gets wind of a violation, they yank your license. There is no way to stop this from happening. The ONLY thing you can do is request a hearing to challenge the violation. If you win, the violation is dismissed, and your license is reinstated again. If you lose, then, to put it realistically, you’re basically screwed. Recently, I attended an interlock vendor’s seminar. I walked in thinking I would learn a lot, and while I did learn a number of things, I was literally astounded at the complete lack of understanding many of the other attendees (all lawyers) had regarding how interlock units function and malfunction. This is where my being a Michigan driver’s license restoration lawyer makes a difference. I’m not just “familiar” with the interlock; I work with issues involving it everyday. While I may not have previously considered myself an expert, by comparison to some of the questions I heard asked at that seminar, I sure felt like one. This isn’t a knock against anyone else, but when your fate depends on the information generated by one of these machines, any lawyer you consider hiring better have a thorough working knowledge of them. Beyond just knowing how these machines work, especially in cases involving positive breath samples, a lawyer has to have a very good working understanding of the chemistry involved in BAIID testing in general, as well as how the human body processes and metabolizes alcohol. I do. Beyond just being a lawyer, and even a license restoration lawyer, I am actively involved in the formal University, post-graduate level study of alcohol and addiction issues. This requires a fundamental understanding of pharmacokinetics. I charge $1500 for a violation case. Normally, my first meeting with a client will last at least an hour although it can easily take twice as long. I’ll typically have follow-up instructions for my client, meaning stuff to do after leaving my office, like information to gather or letters to get. When our time comes, I walk into the hearing expecting to win, but that’s always a by-product of thorough, even “over” preparation. Whatever else, you certainly won’t lose because you prepared too well. Yet for all of this, there are cases that are just plain hard. About the toughest situation I encounter is when someone has a start up failure and just bails out and leaves without getting the car started. Instead of trying to provide a breath sample and start the car again a few minutes later, or even going to the police station to get a breathalyzer test, the person will just freak out and do nothing. Now, instead of having something to show that the startup failure was wrong, the positive breath score stands as the only evidence, good or bad, in the case. You simply cannot let that happen. Even in that situation, there are a number of critical things that can be done, both scientifically and personally, after the fact. I will jump right on them. At a minimum, if I can walk into the hearing and show with certainty that, whatever else, my client did not drink on the date in question, it goes a long way to winning. Yet this also makes plain another, less obvious part of the problem: In a failed start-up test, or a skipped rolling retest, the underlying assumption of the DAAD is that the person was drinking. Even if you come in with scientific proof that you absolutely were not drinking on the date in question (I do this routinely), you still have to answer for your failure to test again. In other words, the violation doesn’t just go away because you can prove that you weren’t drinking. Another frustration is when a person experiences mechanical problems and is violated for “tampering” with the device. This almost always happens with when power is lost. It is common when someone has work done on his or her car. Sometimes, the person will have called the interlock company (which you either have, or will, unfortunately, learn is beyond useless) and been assured that everything is okay, only to get violated anyway. This has actually happened when it was the interlock technicians themselves working on my client’s car! Of course, if you think they’d just “write a letter” or make a phone call (there’s nobody to call anyway) and fix things, you’re sorely mistaken. As much as the interlock companies aren’t of much help beyond taking your money, part of the problem is that the state requires them to forward all the date from the machine. This is called a “data dump.” The state really has no provision for the interlock company to call in and say, for example,” That power failure for 2 hours on July 9 isn’t a violation – it happened while we were working on the car. ” Instead, the state gets the data, a violation is issued, your license pulled, and then you have to run around gathering proof of what happened, only to find out the interlock company that has been taking your money won’t help you a bit. This is hardly the kind of jam to try and get out of by yourself. If you try your own license appeal and lose, it’s usually not too hard for someone like me to fix things so you can win next year (assuming, of course, that you’re really sober). If you lose your violation hearing, you not only lose the ability to drive, but you kind of lose the ability to win another hearing for quite some time, because you’re seen as having violated in a way that almost certainly means you drank. The worst part, for me, is that the vast majority of violations I see happen to people who were absolutely not drinking. I really think the whole violation system is broken, but there appears to be little interest in fixing it, at least on the state’s part. In the meantime, if you have to deal with a violation, you need to be proactive. You really do need to get moving quickly. This is not a job for a lawyer who thinks he or she can “do” it. There really is no recovering from a loss at this stage. The stakes are critical, so you need a lawyer, like me, who has a detailed understanding of the science of pharmacokinetics as it relates to alcohol as well as the mechanics (and science) of ignition interlock devices.